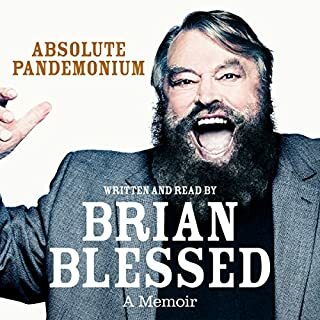 Where does Absolute Pandemonium: The Autobiography rank among all the audiobooks you’ve listened to so far? The performance is a masterclass, it truly feels like he WANTS to tell his story and enjoys doing so. I have to say I was eager to hear the Flash Gordon chapter and was delighted at how much Time Brian spent going into detail and spouting superb anecdotes. Like many, I only know Brian for Flash Gordon and his wonderful voice and personality, for this reason I was going to pass on this book. There were a few reviews advising that it was enjoyable despite not knowing the chaps work. PLEASE take the advice as did I, the performance alone is worth the cash, the story is lovely and very surprising at times. He's chosen to mix up the chronology which works fine for this book, it comes together as you progress. Most of all it's an absolute pleasure to enjoy a biography of someone you can tell is genuinally delighted to be reading to you, he's proud of his story and it shows. I appreciate when he tells of a TVs show or acting job there is lots of detail allowing you to build a true picture. Now b..... Off I'm off to watch Flash Gordon again. No, just for Frost fans. 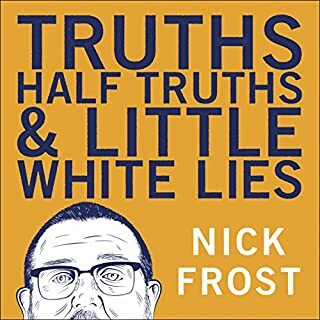 What was most disappointing about Nick Frost’s story? Which character – as performed by Nick Frost – was your favourite? This started off very promising, a real early years story. Sadly from Kibbutz to spaced was bumming about which although true isn't worth reading about. Frank Skinner is undoubtedly one of the funniest and most successful comedians appearing on British screens. Born Chris Collins in 1957, he grew up in the West Midlands where he inherited his father's passion for football, a West Bromich Albion supporter, along with a liking for alcohol. Expelled from school at 16, Frank held various jobs, later going on to gain an MA in English Literature. 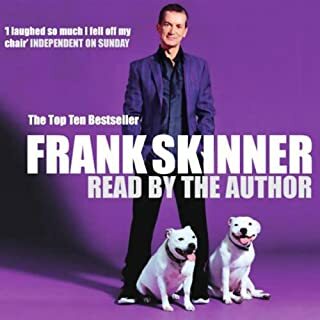 What was most disappointing about Frank Skinner’s story? It was like an incoherent highlights package, kind of like watching a movie that cut 80% out randomly. I know this is a great book having read the hardback on release. I recently read Kevin Bridges book which subliminally makes you want to read or retread Frank skinners book. I genuinally never noticed it was an abridged version of just over 2 hours. This DOES NOT work for an autobiography. I can understand abridged for artistic reasons but it really spoils what is a superb book. My rating reflects the fact that a short version like this is near worthless. Would you listen to We Need to Talk About Kevin Bridges again? Why? I've already listened twice, it's compelling. 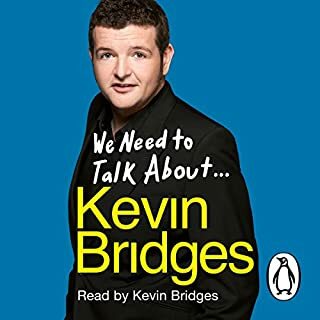 What other book might you compare We Need to Talk About Kevin Bridges to, and why? Naturally you compare it to the vast array of comedy biographies. Which character – as performed by Kevin Bridges – was your favourite? Pop tounge in in lower gum and make awughh noise. I laughed out loads, I laughed like I may have done listening to billy Connolly tapes as a kid. I cried a little, Kevin's family, particularly his brother just comes across as the brother every kid needed.There's even a little participation which given the right mood will have you screaming out loud. I agree with some that it drags at bits, however after the first hour or two it's a very addictive book. I would say that anyone would enjoy this book. 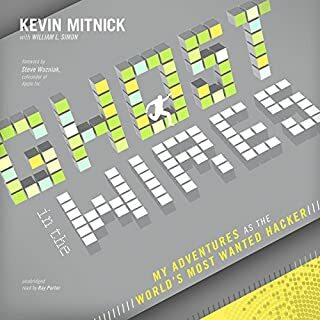 It's like a thriller/ crime novel with a bit of hacking for dummies thrown in. 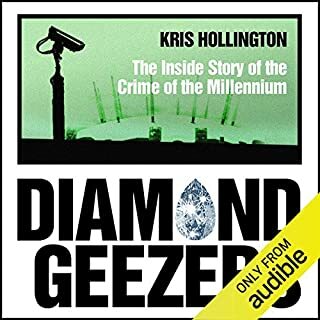 For the first time since that extraordinary day, investigative journalist Kris Hollington lays bare the bones of the case, using exclusive, in-depth interviews with the Diamond Geezers, the police, Dome workers and De Beers employees to get to the heart of the heist. Discover who was crazy enough to want to buy the hottest diamonds in the world, as well as the shocking secrets of the planet's most precious diamond collection. What disappointed you about Diamond Geezers: The Inside Story of the Crime of the Millennium? The story isnt that exciting, its a foiled raid which takes about 1 hr to tell. The rest of the time is padding with occasional seemingly less relevant tales. Would you ever listen to anything by Kris Hollington again? Sure, this is just one not so great title. Who might you have cast as narrator instead of Colin Mace? I kept going back to this thinking it was going to go somewhere but it doesnt, the main story is told with 5 hours still to run and it literally just pads out. The idea of of the big diamond theft is exciting but really the story is not. I kept assuming there was a big twist but No. They literally drive a jcb into the dome and get arrested, the end. Glimpses of magic but too rare. More detail, slower narration and focus more on the band evolvement, which lets be honest thats why we read musicians biographies. Would you ever listen to anything by Suggs again? There is a warm, interesting story dying to get out. He has tried his own style of book and i applaude him for that unfortunately for me it just didnt quite come off. I like the idea of telling the story in years chronologically particularly as pre fame biogs can be dull, however this led to a lack of detail and 5 hours in i was still thinking i had hardly learnt anything interesting about this guy. Even anecdotes which were presumably included for humours sake were badly written ( parmesan cheese story came to nothing). 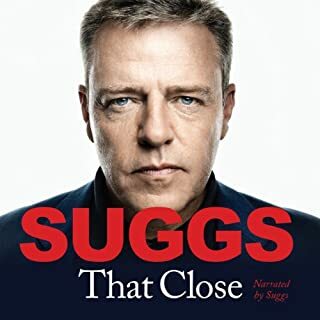 Suggs wonderful voice and style should have been a charm but i think it fails in the reading of this book. I wanted to love this story and indeed will re listen in case ive been harsh. I thought it was turning as they broke into the music scene, the top of the pops were interesting and funny but sadly could have been more detailed. What made the experience of listening to Total Recall the most enjoyable? What was one of the most memorable moments of Total Recall? Lots of moments (24 hour book). Military stories were fun. 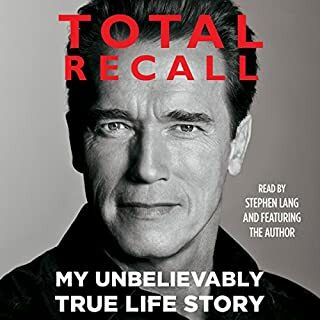 What does Arnold Schwarzenegger and Stephen Lang bring to the story that you wouldn’t experience if you had only read the book? I was disapointed when Arnie only done the first chapter but once the other voice took over he was very good too. I wasnt moved to tears but i was amazed at the honesty regarding his "affair" with the housekeeper. i didnt excpect this to be in the book but it was handled in a very up front manner. I remember reading arnies first biog as a child and being very motivated, now it transpires he did take steroids. This part is handled very tentatively and whilst i loved the story and its telling i think the steroid element should have had much greater importance given in this story. He mentions drug testing happens in bodybuilding now but we know bodybuilders continue to openly abuse steroids.For all his faults which he admits to, Arnie continues to have the ability to inspire. Any young person with a goal or lack of could do worse than listening to this book.Straight into my do not delete library. 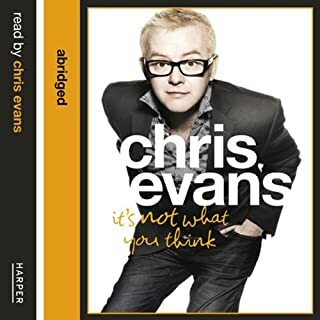 Really fantastic story of a guy who worked rellentlesly to achieve his dream of radio stardom, unlike other biogs i quite enjoy listening to the mad follys and spending sprees he has as he is up front about it all. All i want from a biog is honesty and this one delivers. Fun, insightful but no real gossip. Rob describes his long climb to showbiz success in a highly descriptive fashion, this is very welcome particularly as he begins to breakthrough and we meet the "bratpack". There are some nice stories and i particularly enjoyed the depth of the background tales giving us detail on casting, off set and on set. As you would excpect the narration by the subject is faultless and indeed this is one of the cases where its perfectly read. 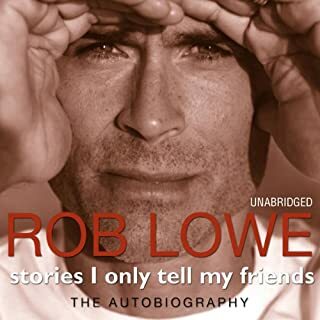 I personally didnt know that much about Rob Lowe before but i feel i really do now, the great aspect is the introduction of so many other people in his story. Michael j Fox , estevez, Sheens etc, i now want to go and find there books to piece it all together.Really great story, if you like movies this will impress you.